Carnegie Mellon University drew more than 600 students to present some of their best work at the 2018 Meeting of the Minds symposium, an annual showcase of undergraduate research. Example projects included the following work by Dietrich College of Humanities and Social Sciences students. What makes one punch line better than another? That question became an obsession for Benjamin Hecht, a senior majoring in linguistics, who has also been known to do improv and sketch comedy. "When professional comedians make a joke, they will tell different versions to multiple audiences in an attempt to improve upon it. They know it needs to be perfected, but it takes continual testing because they're not exactly sure how it should be modified," Hecht said. Hecht undertook linguistics research to analyze spoken and written comedy for a semester-long project advised by Thomas Werner, assistant teaching professor of philosophy. Hecht collected comedy samples and conducted a text analysis on them based on Optimality Theory—a process of finding an ideal output for any given input. He designed and applied a long list of constraints based on comedic attributes, including: repetition, interjections and offensiveness and other characteristics, such as succinct jokes versus those that require long explanations. Hecht found differences between older generation and modern-day jokes, in that modern jokes were more humorous when not over-explained and allowed audiences to make inferences. He also found overall successful jokes shared similarities to a good conversation, one that is targeted to the listener and feels natural and uncontrived. One student team found a correlation between higher academic performance and students who talked or texted regularly with their parents. Interestingly, the result came from a survey targeted to freshman living in CMU's residence halls. The project satisfied an assignment for Statistics Instructor Robin Mejia's Sampling Surveys in Society course. "It's been studied that strong family bonds are correlated to student health and student performance, and our survey results were consistent with those findings," said Jennifer Zhuge, a junior majoring in statistics and machine learning. She added, "Another interesting point, we didn't find too much of a difference between U.S. domestic students and international students in terms of how much they were in contact with their parents. Technology has made it so distance no longer becomes a factor in how much you're communicating with your parents." Senior Korrawat Jianthanakanon, who has an interdisciplinary major in the Dietrich College, said the course gave him a solid understanding in the ethics of conducting research with human subjects. Other members of the student team included junior Christopher Hwang, a statistics major, and seniors Gavin Yuen, who majored in business administration, and Jordan Wong, an economics and statistics major. Military Coups and Civil Resistance: How Does Bloodiness Matter? Jacqueline Puschmann (DC’18), a student in the Institute for Politics and Strategy, does not avoid conflict, and her research under John J. Chin, a post-doctoral fellow, delved into it. She waded through reports on numerous military coups between 1945 and 2017. She sought to figure out which coups were highly aggressive and measured their "bloodiness." To measure the degree of bloodiness, she combed through news articles looking for variables, which included a range of reported evidence, from troops mobilizing and shots fired to the number of casualties and fatalities. Puschmann is not bloodthirsty but quite the opposite. She sought to understand whether a coup's level of aggression had an influence on the longevity and success of the post-coup regime. If coups were aggressive, would they lead to an increase in public protests that would eventually force out the post-coup leaders? "The research question I am proposing could benefit conflict resolution scholars. By studying coups and their after-effects, scholars would be able to better understand how unstable and autocratic countries progress into a democratic, stable society," she said. Her preliminary results showed that successful coups tended to have higher number of casualties. 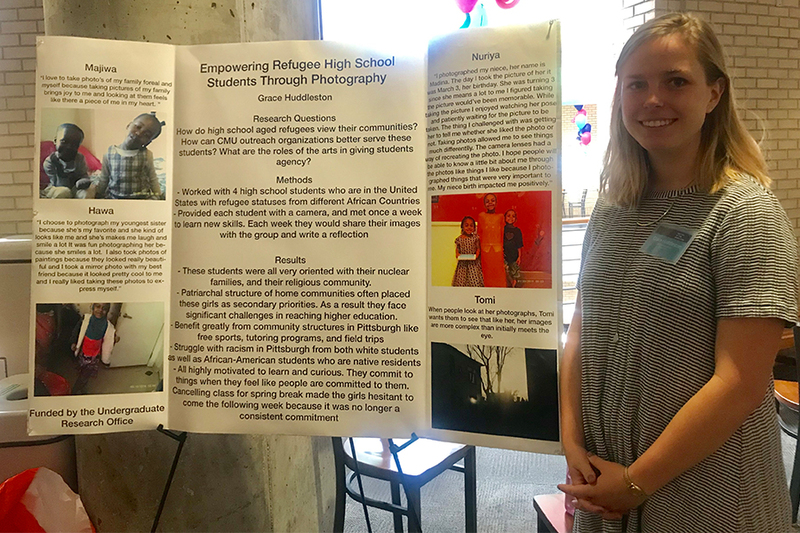 The topic was a great precursor to her summer plans; Puschmann will intern at a national security think tank in Washington, D.C.
After volunteering as a tutor, Grace Huddleston, a junior in the Bachelor of Humanities and Arts Program, felt compelled to learn more about refugee families in Pittsburgh. "These students struggle with discrimination from both white students and from native African-American students because of their refugee status. The girls are also challenged because they come from home countries that do not prioritize education for girls," Huddleston said. Through her project, Huddleston equipped four students from different African countries with a camera. They shared their photos, which often included their shots of their homes, neighborhoods, and family members, and they wrote weekly reflections. The Undergraduate Research Office funded her work. "I hope people will be able to know a little bit about me through the photos… I photographed things that were important to me," said one study participant. Huddleston organized an art exhibit of the project's photography on campus in May that was attended by the photographers and their families. "Art organizations can have a role in giving these students agency," Huddleston said.